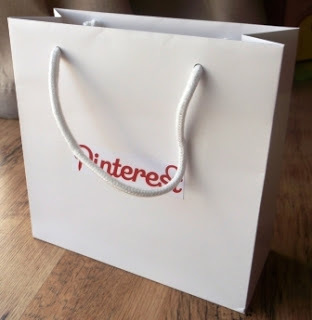 You might remember my excitement a few weeks back at being invited to a party in London hosted by Pinterest. Well, the main reason for that party was the official launch of Pinterest in the UK. Yes, we've always been able to use it, but they are trying to make it more relevant to us over here and one of the things they've been doing is promoting bloggers' pin boards to new people signing up. I've noticed a heck of a lot of people signing up to follow my Handmade board on Pinterest during May, so it's obviously kicked off well! 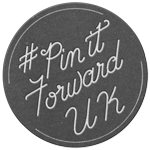 Bloggers have been taking it in turns to tell you about Pinterest as part of the #pinitforwardUK campaign and today it's my turn. Yesterday was the turn of the lovely Colleen at The Magic Bean - thank you for introducing me, Colleen! Pinterest is an amazing way to collate images and links. It's described as a social network, but you really don't have to use it in a social way for it to work well for you. I collect images that inspire me and links I might want to revisit - it really is that simple (and that clever!). When you also share images from your small business or blog, you'll find they help drive traffic your way, too. Pinterest is actually my biggest referrer (after Google) to this blog, which is all the more amazing because that isn't why I use it. I'd definitely recommend it to anyone interested in visual collections - crafters, artists and designers would all love it. 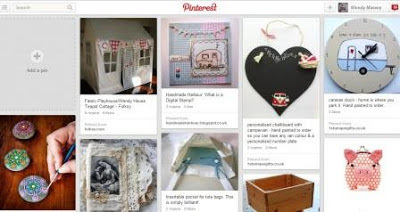 And if you are planning a new home, a garden redesign, a wedding or party, or just want to learn something new... then you'll be able to collate ideas, inspiration and website links on Pinterest - it's a bit like a giant, online, well-organised scrapbook, which you can share (or keep all to yourself - there's an option for secret pinboards too!). If you are new to the whole Pinterest thing, feel free to join Pinterest here (this link will tell them I sent you and you can follow my Handmade board automatically). If you are already on Pinterest, you can view and follow all my pin boards here, although it's possible you might wonder what on earth some of them are all about. They work for me - I'm currently collecting inspiration and ideas, some of which will kick off ideas I can use in illustrations for my digi stamps! Others are just stuff I admire. And others are links to sites I want to be able to find again. What do you/will you do with Pinterest? Great post! I had no idea Pinterest were going to be making the site more UK friendly. I do use Pinterest but I hadn't spotted that! I've also somehow missed their promoting bloggers' boards. Strange! My eyesight's bad but it's not that bad haha. Hi Catherine! The promotion of bloggers' boards is just to new people signing up, so you probably won't have seen it. I'm not sure of the full details of the UK-friendly bit - it's to do with spellings and relevance of pins, I think. Ah, right. It must be pretty subtle then! I know followers on my Handmade board (the one of mine they are promoting) has jumped from around 400 followers to about 1200 just during May, so they're obviously doing something to draw attention to it! Thanks Lauren - the party was a lot of fun and an amazing opportunity to meet the Pinterest team and other bloggers (and Pinaddicts!). I love that CD coaster idea too! I've been "on" for about a year or so... It can be sooo addictive! -- Sort of Reality-Scrapbooking-Tweets! My "crafty" Sister [think Martha Stewart on meth] yet, cyber-challenged, recently acquired an iPad-mini and was soon introduced to Pinterest... Although She has yet to figure out how to manage an account, She nevertheless has mastered the "Looking around" part! I also set up a Board for the stuff She does... The Thing gets more Hits than MY Other Ones!! - It's all in the "keywords" I guess?! -- BTW, we're at "hmbyauntieshan" -- NEW "FOLLOWERS" are always welcomed! Thanks Wendy for making Pinterest sound less scary than I thought it would be. I shall definitely be heaading over there in a day or two and take the plunge by signing up to it. Unless you are scared of becoming a Pinterest-addict-recluse. That's a real possibility for anyone, I think. Auntie Shan - oh yes, certainly is addictive! It's sometimes hard to work out why some things seem more popular than others.